Getting a log home construction loan is a sensible way to handle the significant outlay of money necessary when building a log cabin. It’s important to note that even if you are turned down by one lender you should shop around to compare. Different lenders may have different limits and you may qualify for a mortgage loan elsewhere. Not every bank will lend money for a log cabin since cabins aren’t as common as conventionally-built homes and banks tend to be very conservative. They need to assess the value of the cabin based on “comps” or comparable properties. If there aren’t many cabins around to compare with, they have trouble deciding on the value. There are log home lenders online who have experience with cabins and can walk you through the various stages. It’s a good idea to get pre-qualified for a log home construction loan. This can be a rather informal conversation with your bank to give you and them an idea of the scope of your project. A quick-and-dirty figure to use for your budget is 2 ½ times your annual income. The bank or lender will look at two different numbers for your log home construction loan: the first number is your credit score. To improve your credit score experts agree that you should not be using any more than 25% of your available credit. This is known as your Credit Utilization Ratio. Contrary to what is commonly said, it is NOT a good idea to close a lot of your credit cards before getting your credit score checked. You can organize and track all of your income, expenses, net worth, bills and asset allocation using Personal Capital's free financial management tool. Doing this will lower your available credit and therefore drive up your Credit Utilization Ratio. Banks and lenders will want to see a minimum score of 620. These services will calculate your credit scores based on one of the three big credit bureaus (TransUnion, Experian and Equifax). As a result, the scores are not exactly what you would get from FICO, but a very close comparison. You are allowed one free credit report per year and it’s a good idea to take advantage of this to ensure that there are no errors and to get an idea of what your lender will see. When you fill out your application you tell the bank or lender your income, outstanding debts and other personal information. They will calculate your debt–to–income ratio (DTI). Traditionally you will need to have a DTI of 35% or less. Log home lenders online generally have calculators available. The second number your lender will look at is the appraisal where the bank or lender assesses the value of your home once built. They will loan you a percentage of this amount, typically 80% - 90%. For your application you will need to have in hand your house plans, blueprints, land deed, signed builders contract, permits and cost schedules. Typically the bank or lender will determine the “draw” schedule showing what monies get paid out when. A log home construction loan is a short-term loan, often good for 6–18 months and requiring that construction begins within a set time period. It is an interest-only loan meaning that you only pay interest and only on the money that has actually been paid out to your builder or log home company. 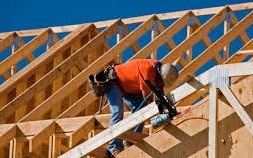 Cabin construction loans will generally require you to carry log home insurance known as Builders Risk to protect their investment during the construction process. Once the home is completed you need to either pay off the loan or convert it to a permanent loan or mortgage. Check with your lender as this can often be performed at the same time as your construction loan, saving a second closing and its associated costs. This is called a construction–to–permanent loan. Be sure and check around with different lenders for competing costs and loan factors. While it’s often a good idea to stay local where you’re able to deal face-to-face with a person, many small towns don’t have banks with experience building log cabins. In those cases, there are large national log home lenders that specialize in log home construction and they have everything in place to deal with the special factors involved in building log homes.